Barbara A. Blake, 72. of San Diego, Ca., died Friday May 21, 2010. BORN: January 11, 1938 in Easton, Pa. Personal: Barbara was a world traveler. She visited over 100 countries and lived in Saudi Arabia, Australia, Malaysia and several other European countries. 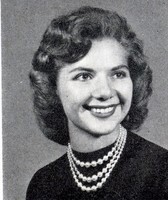 She graduated from Easton High School in 1956. Barbara had been widowed twice. Survivors: She is survived by two sons and four granddaughters. Note: There was no obituary. The information above was obtained from Barbara’s past correspondance to the newsletter.